When you think of eating out in Port Stephens, it has traditionally been beachside fish and chips that comes to mind. But now there are plenty of alternative options, thanks to a bunch of passionate local foodies. Here’s our pick of the trail, to take you from breakfast through to dinner. Start your day at one of Port Stephens’ prettiest spots for breakfast, Crest Birubi Beach, at Anna Bay. This modern cafe has fantastic views of the ocean and is separated from the sand only by a patch of foreshore grass. It’s a popular place with locals and tourists, with a menu that caters well to both health-conscious folk and those looking to indulge. Think quinoa parfait with poached winter fruit, coconut yoghurt and honey syrup as well as Boston-style baked beans with thick white toast and chorizo. Enjoy a lazy start here before joining the surfers on the waves below. When you get a hankering for a mid-morning sugar fix, you’ll want to head straight to King Street Confectionery, in Raymond Terrace. You’ll be transported to another era as soon as you step through the door of this homage to ‘heritage sweets’. From Australian-made hard-boiled humbugs and bulls-eyes to classic Choo-Choo Bars, sherbet cones and heavenly handmade musk sticks, you won’t be left wanting. It’s a popular coffee stop for day-trippers to the nearby Hunter Valley, but, really, it’s more than just a place to pass through. Don’t forget to grab some chocolate – the dark square with lemon myrtle will melt in your mouth, as will the bite-size chocolate oozing with real caramel. 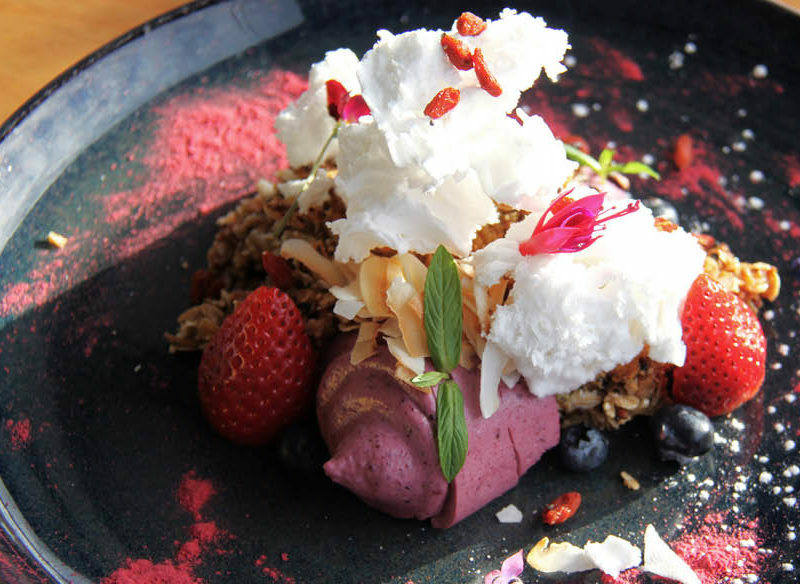 After all that eating, opt for a back-to-basics lunch at Inner Light Tea Rooms, at Nelson Bay. The chicken and avocado salad is a refreshing, healthy choice, while there is also mushroom bruschetta, savoury crepes, and Turkish melts – simple fare done well. But, admittedly, it’s not the food you come here for. Set high on Nelson Head, this place has some of the best views in Port Stephens. Relax on the grass or dine at a table under the frangipani trees as you admire Shoal Bay, Tomaree Head and nearby islands. At day’s end, watch the sun set from the balcony at Little Beach Boathouse, a quick drive over the hill from Nelson Bay Marina. Enjoy a local Angry Man pale ale from Murray’s Craft Brewing Co. , before heading upstairs to the restaurant for a seafood dinner. The saltwater barramundi with chorizo is a delicious choice, while the menu also features miso-glazed Atlantic salmon and Port Stephens rock oysters with Japanese shiso dressing.